Déjà Vu: The feeling you’ve done something before. There’s a much wordier version of the definition, but for the purposes of my own dumbing-down, this will do fine. 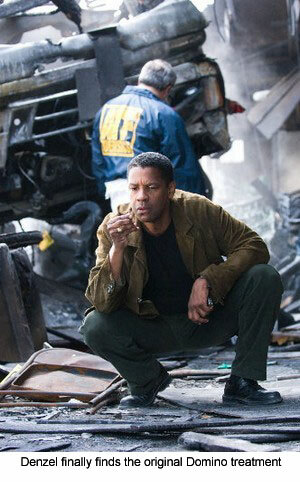 So, it feels familiar: Tony Scott teams up with Denzel Washington in another action flick. However, this movie deals with time travel, alternate realities and touches on fate. Pretty heavy fodder for adventure movie fare; In any case, it all works pretty well. For you Action Jackson fanatics out there, you’ll have to wait until the third act when things like bullets start flying, it’s not super intense like old Scott movies, but it gets that fix in there. What’s really weighed pretty well is the balance of story, theory and physics. It’s all grounded in a very real reality that could be right now, if only you weren’t taking orders from a very fat Val Kilmer. Déjà Vu starts with a literal bang, more like a boom actually; a New Orleans’ ferry is blown to bits: with all the passengers on board. The stakes really couldn’t be raised any higher. Washington is the ATF agent Doug Carlin, part of the explosives task force encompassed with the job of identifying the explosive and finding the culprit – albeit, the case becomes more and difficult with the lack of clues. In comes Agent Pryzwarra (Kilmer) with a fresh perspective; armed with a group of physicists, they’ve have successfully created a viewing tunnel (or rather, wormhole) four and a half days ago. It’s pretty cool technology, and the amount of additional filming must have been hell – the concept is that while you’re able to look four days in the past, you’re also able to view from any angle. Normally, this might present a problem to any normal filmmaker. Thankfully, Tony Scott has much experience in making use of beautiful camera angles, so it plays off beautifully and sea mlessly. The case becomes personally for Carlin as he is smitten with Claire, a supposed victim of the ferry bombing, as he suspects she had expired a good hour before the bomb exploded. Using the very cool time leaping/folding technology, he focuses his time looking at Claire’s last days. As events unfold, he tries to send himself clues to the past, some of them with disastrous results: the message is there – don’t mess with the past! With hours remaining, and culprit in sight, Carlin decides to take matters into his own hands (what, you thought he was going to sit around?) and steps back into time itself. From there it’s a paradox within a paradox, within a tightly wound story. The use of time and ability to watch events unfold in the past is a risky one, but it pays off. There’s a particular scene where the camera can go mobile attached to a Humvee – it’s a chase that happens in the present and the past. And yes, it’s both trippy and cool. Just trying to watch two screens at once in a completely black theatre will either make your head spin or give you attention deficit disorder. 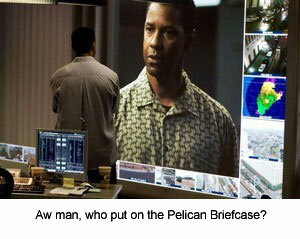 In using the time line plot, everything else certainly helps serve it: the equipment, setting, even the characters. And that’s why I think this movie loses a few points. No one really matures to become a rounded character; everyone is basically static and helps along the story one piece at a time. Don’t get me wrong, when you see Adam Goldberg talk about the Wheeler Boundary, you get the feeling he’s given the speech to a bunch of MIT undergrads. They’re all very convincing, but they only help out this time folding technique. I eve n caught myself enjoying Val Kilmer’s performance for a change: could be because he’s taking a back seat to what could have easily been his own starring vehicle. Hey it could happen – if I told you back in 1990 that the star of Turner and Hooch would win an Oscar, you’d shoot me in the face. 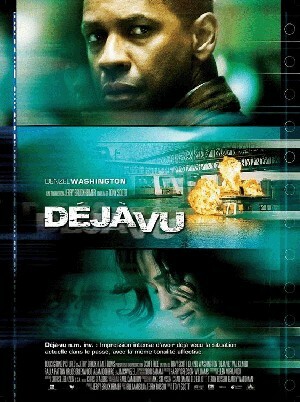 Anyhow, Déjà Vu is gladly not the definition of the contents: you don’t get feeling you’re headed down the same path a hundred times before, rather you’re treated with some nice ooh’s and ahh’s that only Tony Scott can bring you. It’s just a good thing he got away from his over saturated color and blow out lighting done in Domino. Geez, that thing was a technicolor nightmare.